IBM Cloud Private is focused on enabling your enterprise to make the journey to cloud. 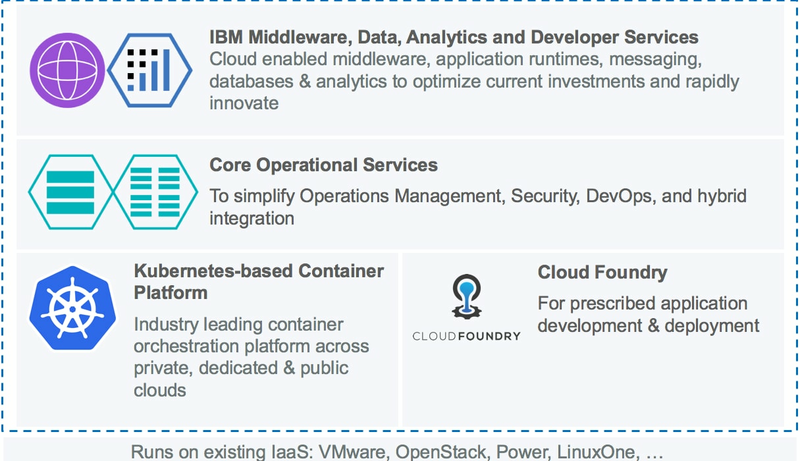 Whether you’re starting with more automation to manage virtual machines or building 12-factor apps on top of container platforms like Kubernetes, all of the pieces are available in one packaged offering from IBM. Start your journey to cloud by setting up Kubernetes from IBM Cloud Private on your laptop (https://github.com/IBM/deploy-ibm-cloud-private) or deploying it for your own technology demonstration on VMWare, OpenStack, bare metal, or your Infrastructure as a Service provider. We are very pleased to announce the release of IBM Cloud Private V2.1! We continue to deliver a full featured Kubernetes 1.7 offering that is now certified against the Cloud Native Computing Foundation Conformance Tests (https://github.com/cncf/k8s-conformance). With an integrated installer, we make it easy to bring the full power of the Kubernetes to your own data center and integrate it with your own corporate identity, role-based access control, and operations policies. We are now introducing a brand new delivery vehicle for our Cloud Foundry Platform as a Service. We make it easy to bring together all of the parts of Cloud Foundry by using containerized packaging and automation to quickly stand up your Cloud Foundry clusters faster than before. We now support many more client-driven customizations than our existing fully managed IBM Bluemix Local offering provides. We are also bringing IBM’s own management console that is built to manage Cloud Foundry for IBM Bluemix Public and Dedicated to the platform, which allows you to use world-class operations visibility across all of your data centers. REVAMPED USER EXPERIENCE: More consistent with IBM Bluemix — providing access to your apps, operations consoles, and a much enhanced app catalog of IBM and third-party software. It’s easy to get started if you’re already familiar with Kubernetes, or use one of the guided wizards to create your apps. PROVISION APPS AND MIDDLEWARE FROM THE WEB CONSOLE OR COMMAND LINE: With just a few pieces of information to customize the chart for your needs. In this example, we’re provisioning MongoDB — we indicate how much persistent storage we need and the system takes care of the rest. Many software packages support out of the box options to scale up or down based on the needs of the developer or operator. When you deploy any of these helm charts, all of the resources that are created are easily available from a single dashboard, with support to drill in to get more details. We can drill in to see the pieces that were setup for us — persistent storage, secrets, configmaps, deployments, stateful sets, or whatever was required for the software package. DEPLOYING SOFTWARE IS ONLY THE FIRST STEP: Operating middleware and apps is critical to to your business. We make it easy to get a handle on how to understand the current health of apps by including a built-in operations stack for monitoring, metering, alerting, and log collection. ENSURE COMPLIANCE WITH ROLE BASED ACCESS CONTROL: In the enterprise, access control means the difference between compliance and being at risk of failing an audit. Integrating common identity management across Kubernetes, the operations stack, the built-in Image Registry, Service Brokers, Metering, and other services deployed on the platform like Cloud Automation Manager. We also deliver a simple definition of Teams, Users, Roles, and associated Resources as well to give you fine grained access control across the platform. 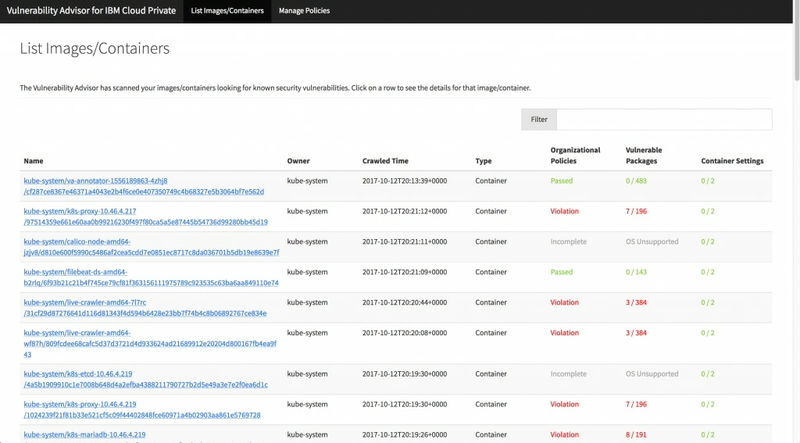 SECURE DEVOPS WITH IBM VULNERABILITY ADVISOR: As images are built and published to the cluster registry, Vulnerability Advisor scans images and configurations to meet established security best practices. Common Vulnerabilities and Exposures (CVE)s are automatically identified and flagged in apps that you build or images you consume upstream. And of course, in the world of cloud, automation is the key to scale. All of our services are available via command line interface, REST API, or both. A newly available `bx pr` command line plug-in for the Bluemix CLI makes it easy to configure your local environment to work with many remote clusters. CLUSTER FEDERATION FOR MULTI-DATA CENTER MANAGEMENT: We also introduced support for Kubernetes 1.7 cluster federation as a tech preview. With cluster federation, you can treat a collection of Kubernetes clusters like one large virtual cluster across many data centers. Federation makes it easier to manage complex High Availability/Disaster Recovery scenarios for your enterprise by making it easy to scale apps across many geographic regions. MULTI-ARCHITECTURE CLUSTERS: And of course, many enterprises are multi-architecture. In V1.2, we offered support for Intel, Power, and GPU-based workers. With V2.1, we have introduced support to run workers on Linux on IBM Z (zLinux). Many workloads are available out of the box in V2.1 which run on all supported architectures, and we will continue to add additional workloads over time. DEPLOY ACROSS MULTIPLE CLOUDS: Containerization of apps brings with it an entirely new dimension to portable, multi-cloud workloads — but some workloads still need to run in virtual machines. IBM Cloud Automation Manager extends IBM Cloud Private with capabilities to manage workloads in both private and public clouds. CAM is easily provisioned from the App Catalog to manage virtual machines by using the open source, multi-cloud Terraform language. With CAM, you can quickly provision infrastructure and deliver application environments reliably and repeatably in IBM Cloud Public, VMware, AWS EC2, OpenStack, and Microsoft Azure. After they’re provisioned, all resources are available in a unified dashboard to provide consistency across multi-cloud environments. GET STARTED QUICKLY WITH COMMUNITY EDITION: We continue our support for our Community Edition to enable developers to get started with the platform hassle-free — if you can pull images from DockerHub, you can get started today! For more information about getting started with IBM Cloud Private CE, see the IBM Cloud Private technical community. Try IBM Cloud Private today! For established enterprises, our fully supported product offering offers Highly Available (HA) configurations of the Kubernetes cluster management plane and well-established IBM Support Lifecycle Agreements (SLA). It’s been a lot of fun working on these capabilities for our users. I’ve only scratched the surface of what’s available on the platform today. We invite you to join our open community on ibm-cloud-tech.slack.com and give us your feedback, or ask questions on StackOverflow tagged ibm-cloud-private.